Pudd’nhead Wilson, a stage adaptation and reinterpretation of the Mark Twain novel of the same name, was commissioned by The Acting Company, Margo Harley, producing director. 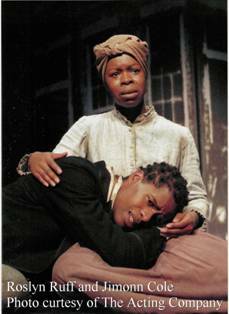 The Acting Company produced Pudd’nhead Wilson and toured it to twenty-two cities in 2001-02. It is the story of the two sons of Judge Driscoll, the chief citizen of Dawson’s Landing, Missouri. Tom is his legal heir and the child of his wife; Chambers is his child by the slave girl Roxy. When Driscoll threatens to sell Roxy’s son , she switches the babies in their cradles. The two boys grow up with each other’s identities – creating a situation both richly ironic and ultimately tragic. Commissioned and produced by The Acting Company, 2001. This touring production culminated with its New York opening at the Lucille Lortel Theatre on May 16th, 2002.